Paramedic Alan Young, left, hooked up Bryan Cheplic, middle, public information officer for the Honolulu Emergency Services Department, to an electrocardiogram machine yesterday. 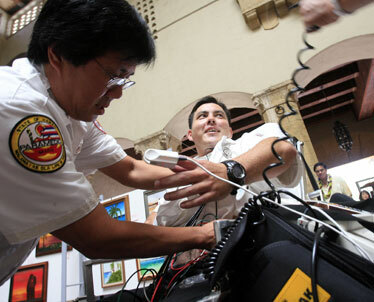 The department showed off new equipment that allows paramedics to send EKG readings wirelessly to the emergency room. Honolulu paramedics used new technology yesterday to help save the life of a heart attack patient, doctors said during a news conference to show off new equipment and software that enables paramedics to wirelessly transmit electrocardiograms to the Queen's Medical Center before the patients arrive at the emergency room. Queen's donated the equipment to the city Emergency Medical Services Division. City and Queen's officials announced the new program yesterday at Honolulu Hale. "It's going to give us the chance to perform procedures that much earlier, save more lives, produce healthier patients," said Dr. David Fergusson, intervention cardiologist for the Queen's Medical Center. Although ambulances were already equipped with EKG equipment, the $20,000 gift for three years includes modems to outfit the 27 EMS ambulances along with the software and licenses needed. The equipment reduces the time from the patient's arrival at the hospital front door to the time he or she receives an angioplasty -- the widening of a blocked artery. Prior to the new equipment, the patient would often take an EKG at the hospital, or the doctor would review the EKG printout after the patient's arrival. Now the modems allow the results to be sent directly to the emergency room or even the physician's PDA (personal digital assistant). A delay can also cause more damage to the heart muscles and complications such as heart failure and bad rhythm disturbances, Fergusson said. 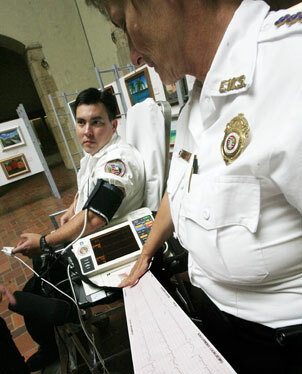 Emergency Medical Services chief Patti Dukes, right, checked a printout from a new EKG machine with the vital signs of EMS public information officer Bryan Cheplic, seated, during a press conference yesterday at Honolulu Hale. The city EMS, in conjunction with Queen's Medical Center, will be using the machines, which allow paramedics to send EKG readings wirelessly to the emergency department prior to a patient's arrival. Fergusson showed X-rays of yesterday's patient, who had an artery completely obstructed by a clot that was opened through the use of an angioplasty (balloon procedure) in 37 minutes, well below the national benchmark of 90 minutes. He also cited another example of a procedure two weeks ago at Queen's that took only 22 minutes from the time the patient arrived at the door of the hospital to the procedure being performed. The new program has been in use since May 1. "Several minutes can sometimes make a big difference in outcomes." said Dr. Dan Smith, medical director of Queen's Emergency Department. Art Ushijima, president and chief executive officer of the Queen's Health Systems, said, "When it comes to a heart attack, time equals muscle, and that what's really important is to free the flow of blood to the heart when it is undergoing a major heart attack. We've recognized this ... to develop programs to shorten time between time of heart attack to intervention." Dr. Libby Char, Emergency Services Department director, said, "This is a great example of a public-private partnership where it's the public that's going to benefit from it." » On Faith: "Body talk"